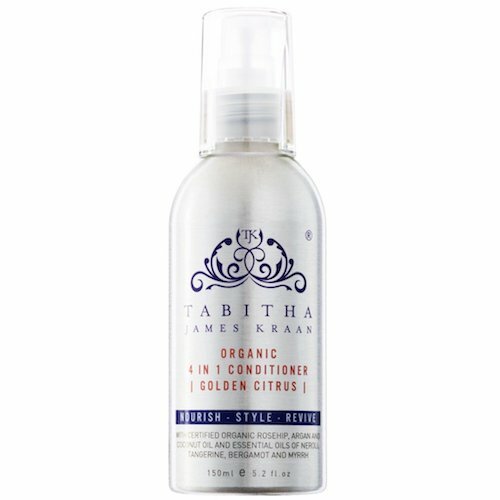 A multi-tasking hair care product, the Organic 4-in-1 Conditioner by Tabitha James Kraan is perfect for use on all hair types. 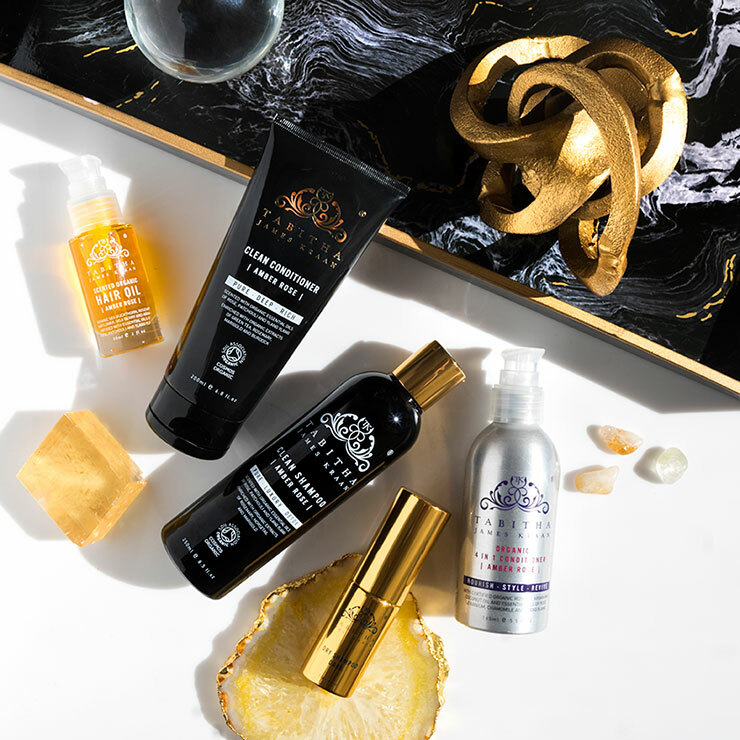 It can be applied as a traditional rinse through conditioner, a moisturizer for dry scalp, or as a styling cream to boost the appearance of volume and curl. 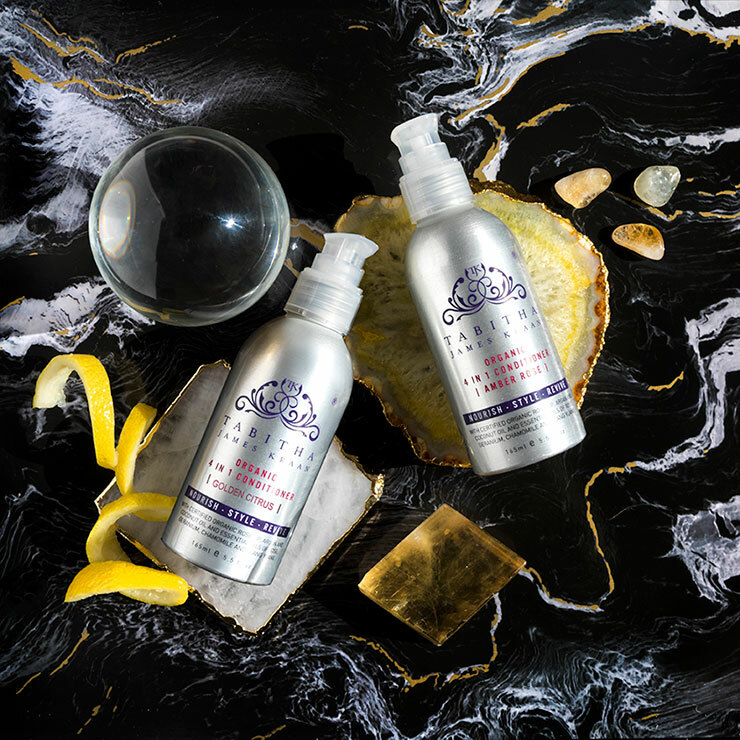 Made with organic ingredients, it makes hair look healthy and strong without silicones that coat the hair. Apply liberally to wet hair from mid-length to end and allow to set for 2- 5 minutes before rinsing. Apply sparingly to clean, wet hair as a leave-in conditioner. 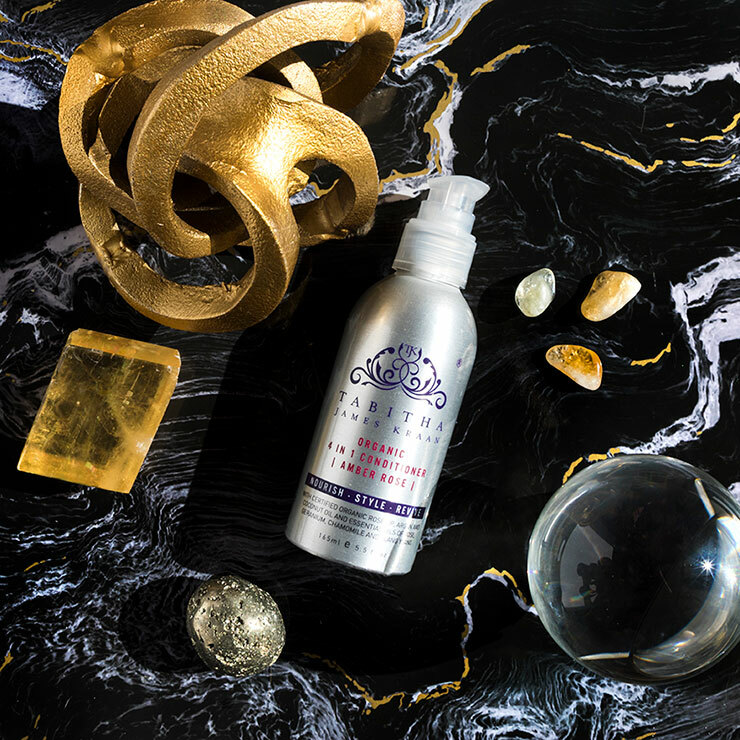 Massage 2-5 pumps onto dry scalp and allow to set for 30 minutes or overnight before rinsing for a nourishing feel. 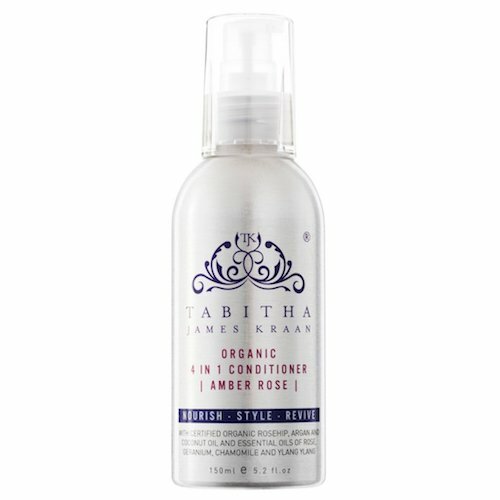 Apply 1-2 pumps to fingertips and run through the ends of hair during styling to enhance a look of bounce, wave, volume or curl. Golden Citrus: Avena Sativa (Aqua & Oat Kernel)*, Argania Spinosa (Argan Oil)*, Rosa Canina (Rosehip Oil)*, Cocos Nucifera (Coconut Oil)*, Cetrimonium Chloride (Vegetable), Cocos Nucifera (Cetyl Alcohol), Glyceryl Stearate (From Glycine Max), Propanediol (From Zea Mays), Salix Alba (White Willow), Citric Acid, Citrus Bergamia (Bergamot)*, Citrus Reticulate (Tangerine)*, Citrus Aurantium (Neroli)*, Citrus Reticulate (Green Mandarin)*, Melaleuca Alternifolia (Tea Tree)*, Commiphora Myrrha (Myrrh)*, Lavandula Angustifolia (Lavender)*, Citrus Aurantium (Petitgrain)*, Cananga Odorata (Ylang Ylang)*. (Citral, Geraniol, Citronellol, Linalool, Limonene – Naturally Occurring Components Of Essential Oils). Amber Rose: Avena Sativa (Aqua & Oat Kernel)*, Argania Spinosa (Argan Oil)*, Rosa Canina (Rosehip Oil)*, Cocos Nucifera (Coconut Oil)*, Cetrimonium Chloride (Vegetable), Glyceryl Stearate (From Glycine Max), Propanediol (From Zea Mays), Salix Alba (White Willow), Citric Acid, Pelargonium Graveolens Roseum (Geranium)*, Citrus Sinensis (Orange)*, Rosa Damascene (Rose)*, Anthemis Nobilis (Chamomile)*, Pogostemon Cablin (Patchouli)*, Cedrus Atlantica (Cedarwood)*, Citrus Aurantium (Neroli)*, Cananga Odorata (Ylang Ylang)*, Hippophae Rhamnoides (Sea Buckthorn)*, Carthamus Tinctorius (Safflower)*. (Citral, Geraniol, Linalool, Limonene – Naturally Occurring Components Of Essential Oils). I like this product. Nice and lightweight. Excellent for my ends. I have fine, straight, flat hair, and this strikes the perfect balance for me. It leaves my hair shiny and soft, but also helps it to behave and gives it some oomph, without static. I like it so much I got the full size in both scents! Bonus- it doesn’t make my scalp itchy.